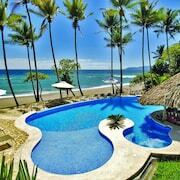 Situated in Cobano, this hotel is within 1 mi (2 km) of Cocal Beach and Santa Teresa Beach. Carmen Beach and Hermosa Beach are also within 2 mi (3 km). The view is amazing and can't be duplicated anywhere. Between the howler monkeys playing in the trees below the restaurant, and the view of the peaceful waves on Playa Organos, it is a great place to stay. The only complaint I have (and not really a complaint, just short sighted on my part) is the limited menu for the restaurant. I tend not to eat many vegetables, so I had a bit of difficulty choosing. That and the sun, bring sunscreen. It only takes a few minutes to burn, and you're going to want to spend as much time as possible in the pool. Where to find Cabuya hotels near an airport? Where can I find hotels in Cabuya that are near tourist attractions? 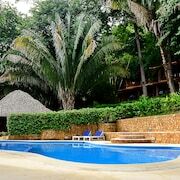 Visitors to Tambor are spoiled for choice when it comes to booking the perfect places to stay in Cabuya. Spend some time exploring our 40 hotel options, which are all within a 0.1-kilometre (0.06-mile) radius of Cabuya's center. There are a number accommodation options within a short stroll from Cabuya's city heart, including the Kalapiti and Mariposario Montezuma Gardens. 11 kilometres (7 miles) from the middle of Cabuya, is the Florblanca. 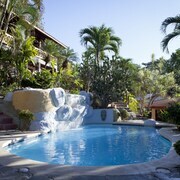 The Hotel Casa Chameleon Mal Pais is 6 kilometres (4 miles) away. 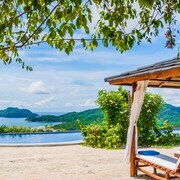 Alternatively, make a booking at the Latitude 10 Exclusive Beach Resort or the Pranamar Villas & Yoga Retreat. Why not experience some more of the beaches and forests that are commonly found in in Central Pacific Coast? Choose to spend a few nights in other parts of Central Pacific Coast. No matter if you enjoy common local activities, for example hiking, or simply tour around to explore the area's offerings you will be able to find suitable accommodation in the area. 6 kilometres (4 miles) to the west of Cabuya is Bejuco, where travelers can enjoy the Cabo Blanco Nature Reserve. 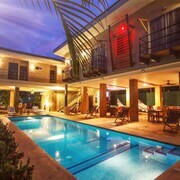 Mal Pais Expedia-listed lodgings include the Hotel Tropico Latino and Nautilus Boutique Hotel. Alternatively, there's Bejuco, 40 kilometres (24 miles) to the northwest of Cabuya. In Bejuco, take the time to check out the Jungle Butterfly Farm. The Hotel Laguna Mar and Cabinas Corozalito are comfortable places to lay your head. Before you leave Tambor, catch a game at Guillermo Vargas Roldan Stadium if you have the time. Book a hotel that is close such as the Casa Amanecer Bed & Breakfast. Juan Santamaria International Airport is located 110 kilometres (66 miles) away from Cabuya. Visitors who choose to stay close by, can book a night at the Costa Rica Marriott Hotel San Jose or Hampton Inn and Suites San Jose Airport. What are the most popular Cabuya hotels? Are there hotels in other cities near Cabuya? 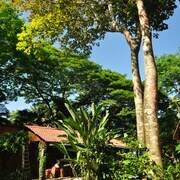 What other types of accommodations are available in Cabuya? Explore Cabuya with Expedia.ca’s Travel Guides to find the best flights, cars, holiday packages and more!